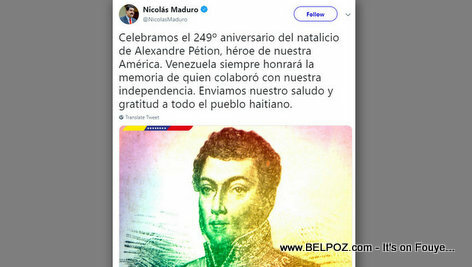 Venezuelan president Nicolas Maduro tweets: We celebrate the 249th anniversary of the birth of Alexandre Pétion, hero of our America. Venezuela will always honor the memory of those who collaborated with our independence. We send our greetings and gratitude to all the Haitian people.